Have you ever heard the saying, “My dogs are barking”? Well let me tell you it has nothing to do with dogs or barking. It has to do with your feet being tired and in pain! I first heard this saying from a nurse that I worked with back when I worked in a hospital. Nurses and many other health care professionals spend a tremendous amount of time on their feet and as a result they frequently experience foot pain and soreness. I of course can relate to this saying since I have a long history of tired feet accompanied with foot pain. I was unlucky enough to be born flat-footed. On top of that I have a high arch. In addition I have a wide foot. As a result I experience more foot pain when compared to your average person. When shopping for new shoes or sneakers I need to take support and comfort into account before fashion and design. So quite frequently I am not left with many choices when it comes to style and fashion. That is why I became excited when I heard about a new shoe company called Vionic and participated in their February Walkabout Challenge – One of the best ways to stay fit is to maintain a healthy diet and walk at least 30 minutes everyday. 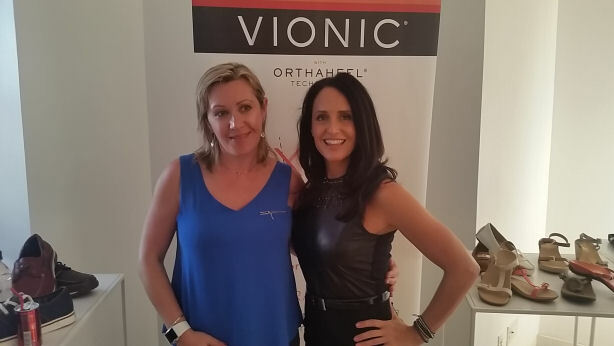 Vionic shoes were designed by a podiatrist, and come with their patented Orthaheel technology. According to Vionic their shoes have given thousands of people the opportunity to live free from foot, leg, and back pain. With this kind of statement I was very eager to give a try to one of their spring styles. I’m not a big fan of plain flat flip flops any more, ever since I heard on Doctor OZ Show, that flip flops, our favorite summer shoes, unfortunately provide little or no support. Not that I didn’t know that, but he also proved the point. They are usually extremely flat with nothing securing the front or the back of the foot. This puts a lot of stress on the musculature of the foot and heel. For my spring/summer wear I chose the Vionic Orthaheel Sandals Glenda wedge in Black as pictured above. Today I’m wearing my Glenda wedge backstrap sandal all day while doing chores, laundry, school pick up and playground hang. And I must say that my foot feels very comfortable. Like all Vionic shoes, these sandals have an Orthaheel technology. It is light weight, flexible EVA midsole absorbs shock, reducing stress on feet, ankles and knees. 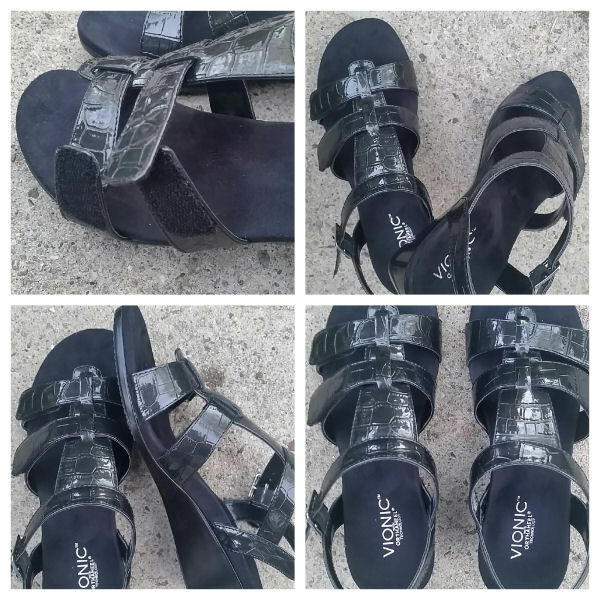 The best part that although the sandals are Medium width, they fit my wide foot perfectly because they have heavy duty velcro straps on the front for easy adjustment. But in my case there’s even no adjustment needed. They are not a fancy shoes, but are stylish enough for every day run around that have medium heel, shiny patent leather and a crocodile leather like look. The quality is very good. I’m happy to report that after the whole day of walking, my dogs weren’t barking. 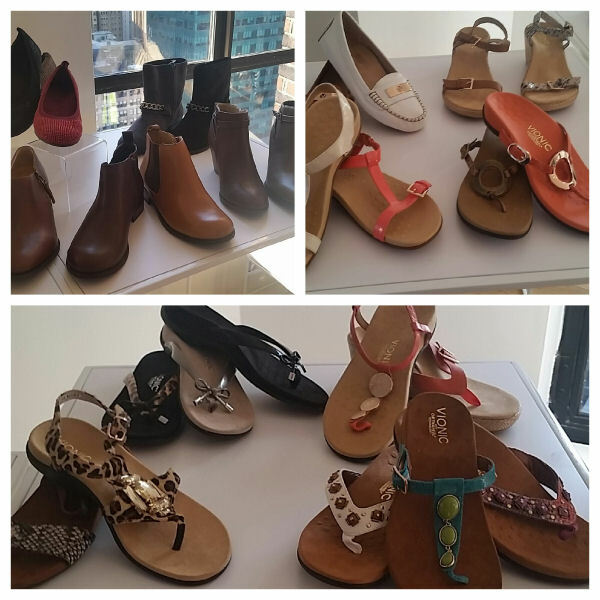 Related: On Wednesday, May 6th, Vionic shoes invited me to a Bryant Park hotel and cocktail party to preview Vionic’s Fall/Winter good-for-you shoes, city chic boots and fun athleisure styles. The event was co-hosted by celebrity fitness trainer Julet Kaska. She is the trainer to Hollywood celebs such as Karlie Kloss, Kerry Washington, Ali Larter, Pink, Kate Walsh and more! Juliet is very fit and beautiful. I got a chance to chat with her about how she trains her clients, what food does she eat, her daily calorie and food intake and exercise. She also talked about that one of the best ways to stay fit is to maintain a healthy diet and walk at least 30 minutes everyday. That is the key! Disclosure: The shoes were provided by Vionic. All opinions are mine. Wedges are perfect for people with flat feet. I love that these are made specifically for people with foot problems. That is really interesting. Thanks so much for sharing!